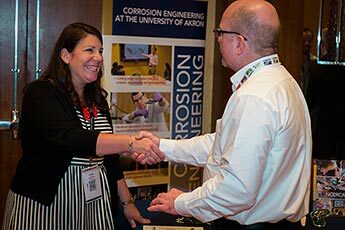 Designed to support technical information exchange, Corrosion Technology Week brings together subject matter experts who are leaders in their respective fields and decision-makers within their organizations. Exhibit space and sponsorship are your company’s opportunities not only to showcase your products and services in front of these key industry decision-makers, but also to cultivate new and existing business relationships. Through exhibiting companies, we can provide attendees with corrosion ideas, technical processes, and the appropriate tools for fighting corrosion. For more information, contact sales@nace.org or by phone at +1 281-228-6411. Additional booth attendant registrations may be purchased for $150 USD. Get your company’s name in front of NACE technical committee members through the below sponsorship offerings. A variety of sponsorship opportunities are available at differing price points. Sponsor is responsible for providing promotional item. Item must be approved by NACE and must be shipped to NACE HQ by August 30, 2019. Sponsor is responsible for providing co-branded bag and promotional item. Bag and promotional item must be approved by NACE and must be shipped to NACE HQ by August 30, 2019. Company logo on 500 CTW mini spiral notepads,* which will be distributed at registration or (sponsors can produce their own notepads). Mini spiral notepads include sponsor’s one-color logo with one imprint area. If sponsor produces the mini spiral notepad, art must be approved by NACE. Sponsorship must be sold by July 31, 2019 for fulfillment. If sponsor produces the notepad, art be approved by NACE and must be shipped to NACE HQ by August 30, 2019. Sponsor may also choose to bring notepads to conference for distribution. Sponsorship includes production of paper water cups. Paper cups to include sponsor’s one-color logo with imprint on both sides of the cup. Sponsorship must be sold by July 31, 2019 for fulfillment. *Sponsorship does not include production of 500 business card cases. Business card cases must be approved by NACE and must be shipped to NACE HQ by August 20, 2019 or sponsor can choose to bring to conference for distribution. Sponsorship does not include production cost of lanyards. Lanyards must be double ended bulldog clipped lanyards. Lanyards must be approved by NACE and must be shipped to NACE HQ by August 30, 2019. Sponsorship includes production of break cups. Break cups to include sponsor’s one-color logo with imprint on both sides of the cup. Sponsorship must be sold by July 10, 2019 for fulfillment. Sponsorship does not include production cost of 500 pens. Pens must be approved by NACE and must be shipped to NACE HQ by August 30, 2019. Sponsorship includes production of 4’X4’ full color meeting room decals. Decal to include sponsor’s full color logo. Sponsorship must be sold by July 31, 2019 for fulfillment.